First Congregational Church (now called Westminster Congregational Church), located next to Lewis and Clark High School, has a long history. 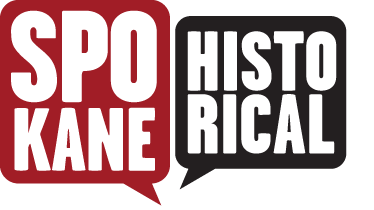 In 1838 when Congregationalists first arrived in the Spokane area. A group working with the local Indian tribes coalesced over the decades, eventually forming a church in 1879 that met in the home of Henry (H.T.) 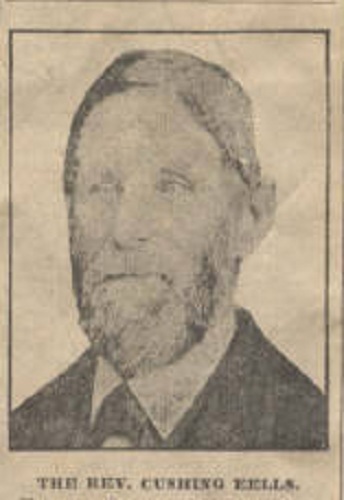 Cowley, who also became the first pastor, then met for two years in the local schoolhouse. The church built its first building (a small wood structure) at the corner of Sprague and Barnard in 1881, but sold it shortly after the Great Fire of Spokane in 1889. 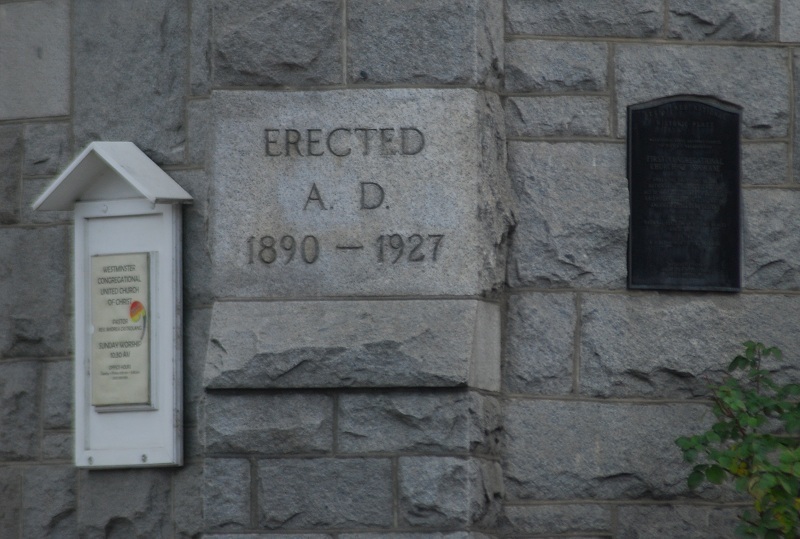 In the aftermath the members sold the land and moved to the present location, building a new church in 1890. This structure was built of stone, sending the intentional message that the church was committed to the rebuilding of the city and there to stay. The bell installed in the tower was a gift from Rev. Cushing Eells, one of the founding members from the earliest period, and it served not only to call Sunday-morning worshipers, but as the warning bell for the Spokane Fire Department. The building has evolved significantly over the years, most obviously in 1927 with the reinforcement of the main spire on the northwest corner (which altered its conical shape to create the current square shape) and the addition of a tower on the east corner where there was originally an open porch. These alterations were undertaken primarily to expand the interior space; aside from the additions, the exterior stone was left intact. This is important, as the uneven coursework is an unusual, even iconic feature that sets the church apart from others. The Church has been central to Spokane society for almost 130 years, hosting not just Sunday services, but many other notable events including revival meetings, holiday rallies, and community events. 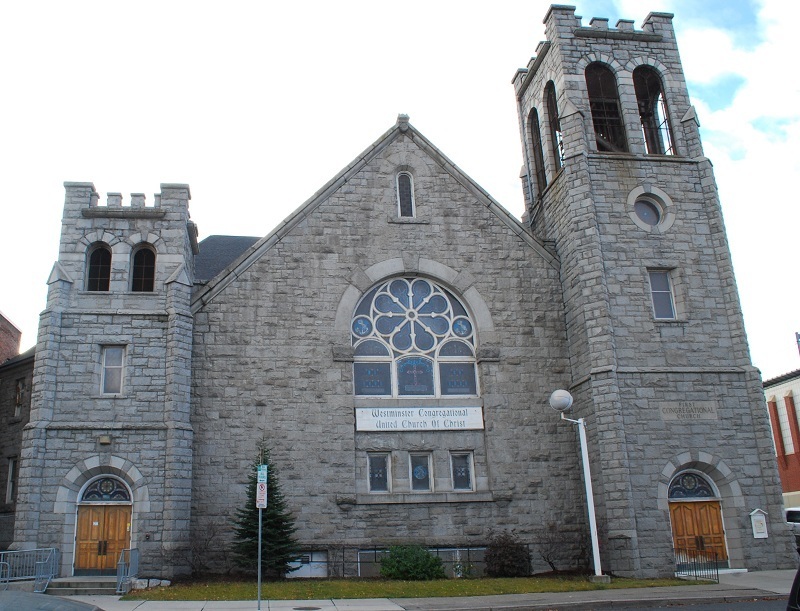 Having benefited from grants by the Spokane Preservation Advocates' Heritage Fund, First Congregational Church is still in excellent condition, and it remains a beloved Spokane landmark. First Congregational Church (Westminster) Front: Front of the church. Note the uneven coursework, massive bell tower on the right, and neo-gothic rosette window in the center (image by Frank Oesterheld). First Congregational Church, Pre-1927 : Early postcard image of the church. You can tell this is a pre-1927 image because the main spire is still cylindrical (courtesy WSU archives). Reverend T.H. Harper and Family: Reverend T.H. 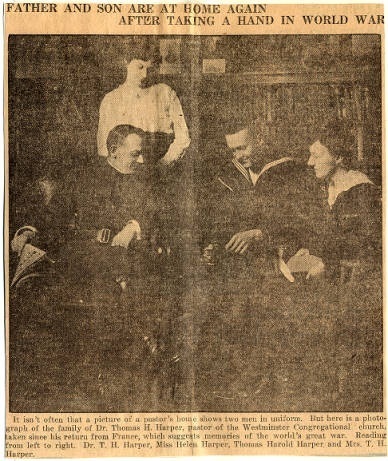 Harper is pictured here with his family after he and his eldest son returned from WWI (courtesy WSU archives). 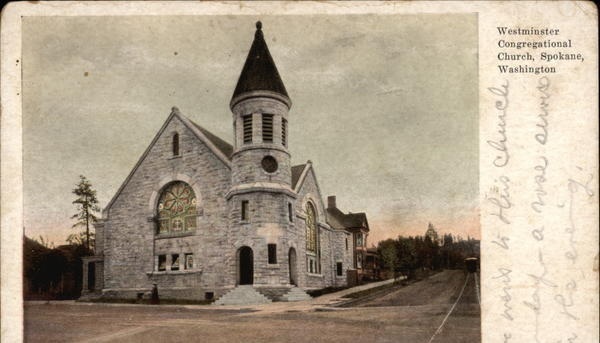 Frank Oesterheld, “First Congregational Church (Westminster UCC),” Spokane Historical, accessed April 21, 2019, https://spokanehistorical.org/items/show/290.